Wearing necklaces or bracelets is great, putting them on can be not so great. Sometimes a little help is wanted, particularly when it comes to those fiddly little clasps. Here is an attractive solution. So attractive it is magnetic. 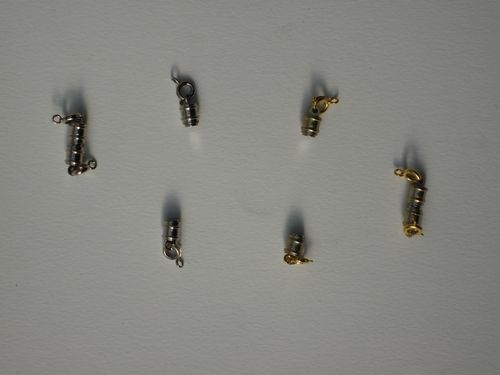 Fasten a magnetic jewellery clasp to each end of your necklace or bracelet. And you are wearing your bracelet or necklace. Quickly and easily without fiddling with those fiddly fiddling catches. Welcome stuff, particularly for people who find this sort of activity painful as well as irritating. Included are four magnetic jewellery clasps, thoughtfully two silvery two goldy, though the daring can mix and two tone them. For some reason we need to discourage the expecting and those with pacemakers. For everyone else, putting on necklaces and bracelets is now great. Magnetic Jewellery Clasps text, images and video are copyright.